Adopts li-ion battery power supply design. Supports radio transmission master control, and can realizes 6-group flash control function easily. High guide number, and supports manual zoom function and S1, S2 optical slave mode. With large-size LCD display, standard PC port and sound prompt system. Additional features: zooming, sound prompt, automatically saving setting, power saving mode, overheat protection, custom functions. Adopts li-ion battery power supply design, ultra-fast charging recycle system. --Equipped with a 1800mAh rechargeable li-ion battery, recycle time is only 1.5s, and flash firing times of full outputs is over 700. Supports radio transmission master control, and can realizes 6-group flash control function easily. --As a master unit, YN860Li supports remote control of flash mode, flash output, focal length, stroboscopic times and stroboscopic frequency of YN860Li/YN560III/YN560IV/YN660/YN968N. Supports radio transmission slave function. --As a slave unit, YN860Li can receive the control and trigger signal from YN860Li/YN560IV/UN660/YN560-TX(II)/RF603(II)/RF605/RF-602, and realizes M/Multi flash. High guide number, and supports manual zoom function and S1, S2 optical slave mode. --GN60@IOS100, 200mmm; you can set flash coverage in the range of 24-200mm manually; supports S1, S2 preflash avoidance optical trigger modes. Supports USB firmware upgrade. 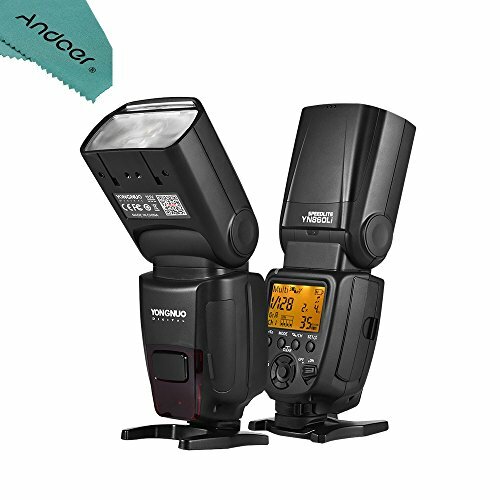 --Equipped with USB interface, you can download the latest firmware from YONGNUO official website to upgrade the speedlite.